As Argentina files out today to tackle Iceland, Barcelona star, Lionel Messi will be under pressure to deliver for his country following Ronaldo's excellent performance against Spain. Lionel Messi’s bid for World Cup redemption begins Saturday when he leads Argentina against an unfancied Iceland side intent on springing a surprise in their first appearance on football’s biggest stage. Messi’s eternal rival, Cristiano Ronaldo, made history on Friday, when he became only the fourth player to score at four World Cups on his way to a hat-trick against Spain to earn a dramatic 3-3 draw. 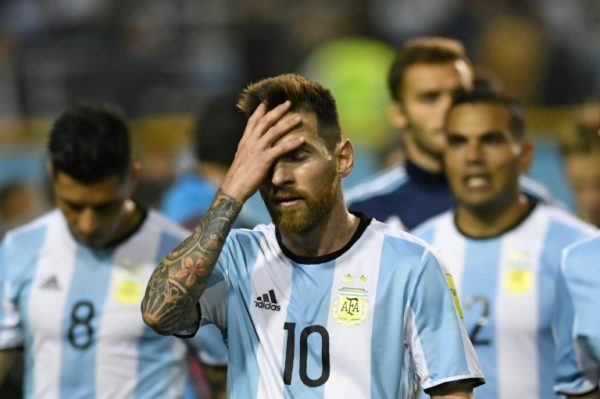 His fellow superstar Messi is under immense pressure to secure his first major international trophy and make amends for Argentina’s loss to Germany in the 2014 final. The Barcelona maestro was not born when the ‘Albiceleste’ last tasted success in 1986 and, at almost 31, knows that time is running out. If Messi’s Argentina are to overcome poor form and injury woes, the five-time world player of the year needs high-profile teammates such as Sergio Aguero, Paulo Dybala and Gonzalo Higuain to fire. “I am convinced Argentina will show we are one of the best teams in the world,” coach Jorge Sampaoli said ahead of the Group D game. They face a gritty Iceland outfit at Moscow’s Spartak stadium who say they respect their illustrious opponents but do not fear them. Spurred on by their fans’ thunderous “Viking clap”, Iceland famously dumped England out of Euro 2016 and coach Heimir Hallgrimsson said he wanted more of the same. The day’s action also pits another scrappy underdog against one of the favourites in Group C when Australia play France in Kazan, with Peru facing Denmark in the group’s other game. While international honours have so far eluded Messi, France coach Didier Deschamps is using his experience winning the 1998 tournament to prime a talented but youthful side. “We can’t afford to get stage fright,” he said ahead of the Group C tie against the Socceroos. Australia lost 6-0 the last time they met France in 2013 but the Socceroos’ Dutch coach Bert van Marwijk said self-belief was the key to securing an upset.